Due in part to natural curiosity about the world, and the fact that I like to be well-informed so I can effectively argue, I Google basically everything I have a question about. I am so out of the loop when it comes to running that I feel like I'm just beginning again. Having approximately 3.1 miles under my belt for the entire month of February thus far, I'm searching for things like beginner's running plan and how to determine tempo pace. 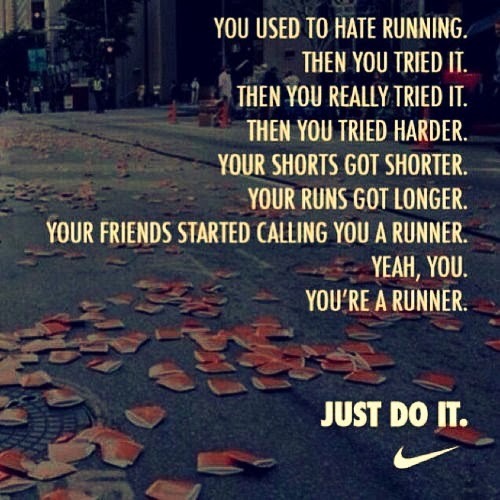 I don't feel like a runner anymore, rather a runner wannabe. It's odd to think that I used to actually create training plans for people. I used to work in a running shoe store! I was a wealth of knowledge when it came to running! But all that has left my brain, and been replaced with how to thank people for giving you cash, peaceful cohabitation, and how to train cats. I suppose all is not lost, though. I'm experienced enough to know that doing too much, too fast is a recipe for injury. I know that the first few weeks are the most difficult. I know that lots of small goals are much better than one large one. Tomorrow's goal is tonight's Google question: How to get out bed in the morning to run when it's cold (but your husband is hot).